Oddly, almost all of these files are cut off or overlapped by other data. 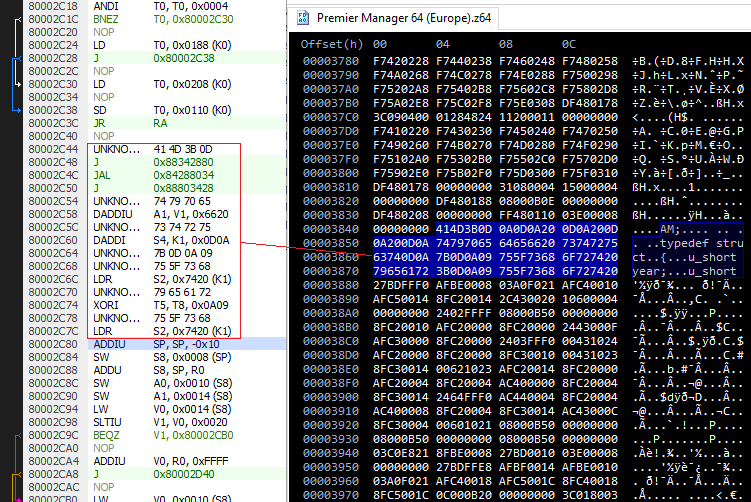 In one instance, there is even a snippit of C code randomly sitting between two compiled assembly routines! In the Chameleon Twist code, it looks like there may be a bunch of strings in Japanese but I don't know how they're encoded. I tried viewing the file as Shift-JIS and EUC-JP, but neither of those looked right (I wouldn't know for sure though). // Kill the whole damm thing. Very interesting finds Shygoo. TCRF would thank you. Quote: A word fitly spoken is like apples of gold in pictures of silver. Text encoding in the Chameleon Twist data seems to be Windows Chinese Simplified, CP 936 / GB-2312. Here's a scan I did for filenames: http://shygoo.net/n64-uncompiled/n64-filenames.txt -- Not as cool as actual source files themselves, but still interesting to see nonetheless. I checked to see if data from the NES rom was present in the N64 rom, unfortunately I didn't have any luck. There is some C code in this ROM too but it's just a bunch of extern int declarations. I'm willing to bet there is a lot of uncompiled stuff in Glover 2. (02-05-2017, 02:43 PM)Skeletons Wrote: I'm willing to bet there is a lot of uncompiled stuff in Glover 2. As long as you're here mentioning Glover 2, any chance I could get a response in the topic you posted? There's a Glover 2? I'm finding out about a lot of sequels I never knew existed this year.